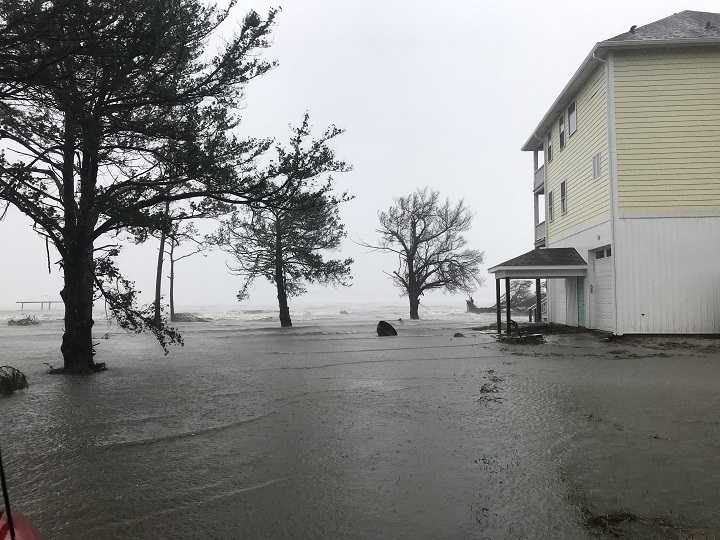 DOWN EAST CARTERET COUNTY – Hurricane Florence ravaged in mid-September most of the coast of North Carolina, leaving a trail of billions in damage and untold destruction. Down East Carteret County, more than a dozen unincorporated but close-knit communities situated between Beaufort and Cedar Island, is in the beginning stages of recovery from the disaster that caused many to lose their homes, their businesses and their life’s work. 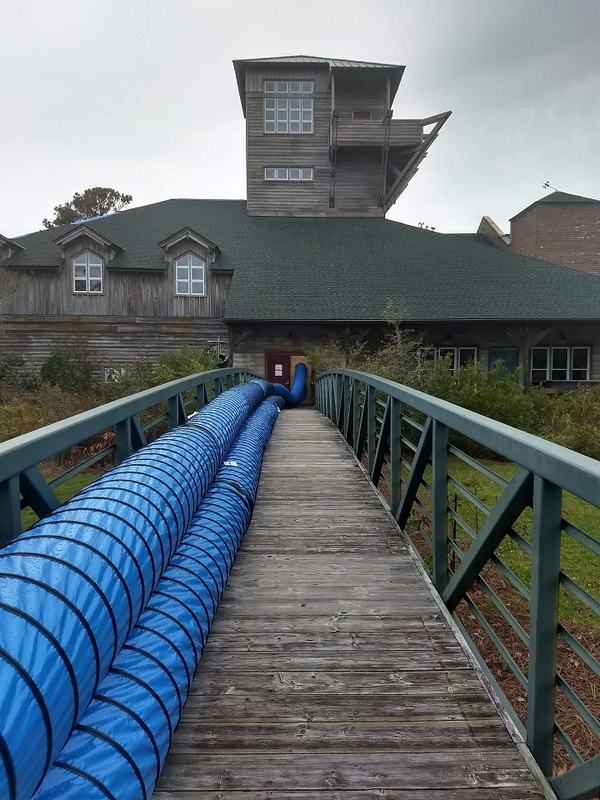 The Core Sound Waterfowl Museum and Heritage Center on Harkers Island was hit especially hard. Once filled with artifacts that illustrated life Down East, the museum was nearly empty Friday afternoon, save for boxes of various sizes waiting to be moved and equipment brought in to help manage moisture. Pam Morris, exhibition curator, weaved through movers working on the second floor. She said that there was no damage to the artifacts because the items were either covered in plastic or in a case, and nothing was wet in the office, which they were in process of packing up. She added that they have fine arts insurance as well as facility insurance. 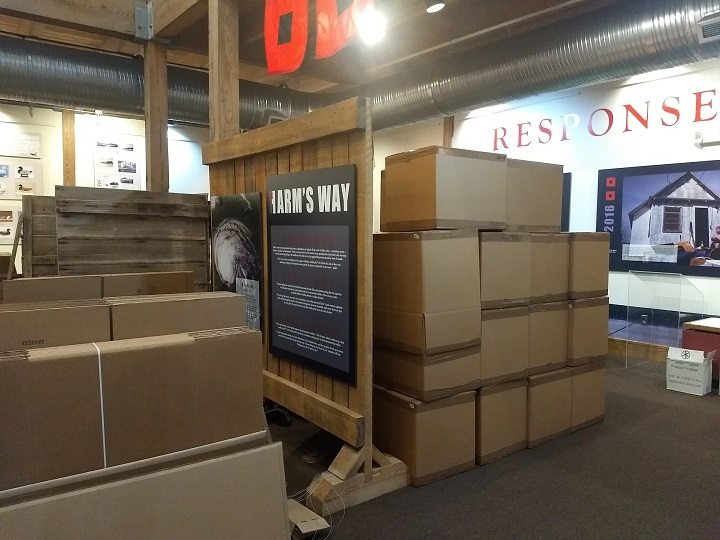 Fine arts handlers packed up the collection for further documentation and light conservation work to be done while the building is being repaired and the museum gift shop has been relocated to a storefront at 806 Arendell St. in Morehead City for the time being. 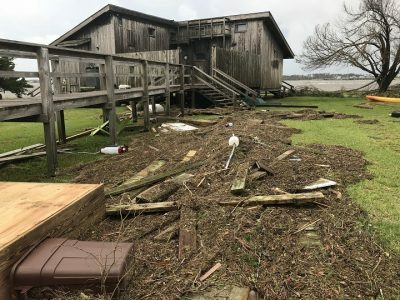 We’re going to have to figure out what we can do to be in better shape for the next storm, roof wise, which is probably the case for a lot of people,” she said. Worst-case scenario is that it will take six months to have the building operational, she said, and there are no preliminary numbers on funding they’ll need to get back open. Morris said if folks wanted to help but couldn’t make it to Harkers Island, the museum website has a page marked to donate for the recovery effort. “That’s how people can help, we’ve had tons of help from the community, thank God for them, but we also need other help as well. We would be so appreciative if they logged onto our website and made a contribution earmarked for the relief effort,” she said. “We’re going to recover, be better than ever, and I think we’re going to come out in on the other side in probably better shape than we were going in,” Morris added. Gloucester resident Barbara Garrity-Blake was also taken by the outpouring of kindness showed during and after the storm. “The damage Down East, like in so many areas, is devastating, but response to the storm’s aftermath has been overwhelming,” she said. Fire departments Down East were the points of emergency supply drop off and distribution and firefighters and other first responders worked around the clock clearing roads, checking districts and fielding calls. Garrity-Blake said that many took it upon themselves to drive in from Asheville, Raleigh, Charlotte, you name it, to help. “I was especially moved by a Hispanic family – mother, teenage daughter and little boy – who drove two hours from flood-ravaged Kinston. 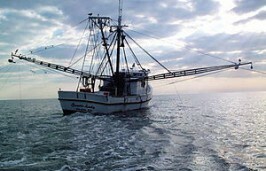 When I asked them what they needed, they told me they didn’t need a thing – they had come to help Down East,” she said. They came with a van full of bleach to donate and helped at the Marshallberg Baptist Church serve meals that evening. 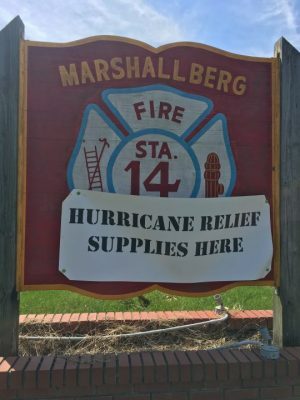 The Down East Council, which serves as a voice for the communities, is meeting 7 p.m. Tuesday at the Davis Volunteer Fire Department, she said, “to talk about how we can improve storm preparation and response for the next time, and we know there will be a next time. It’s appropriate that we are meeting in Davis, the epicenter of damage Down East.”The discussion will also focus on addressing concerns at the county level. Lillie Chadwick Miller with the Down East Council reiterated the level of damage Florence produced throughout the county and especially the communities Down East. “Many agree it produced more damage than ever before; and another comment reflected the fact that water came higher onto their property than they have ever seen,” she said. In terms of recovery, Miller said it will be slow for many. Miller continued that with more and more homes deemed uninhabitable, the residents are finding themselves in dire situations. Among those pitching in at the museum was Liz DeMattia, lead scientist for the Community Science Initiative at Duke University Marine Lab, along with faculty, students, staff and their family members. Many different groups have helped out from Duke Marine Lab in whatever capacity the museum staff needed, DeMattia explained. She said that groups shoveled mud and ripped carpets at one of the Down East churches, cleaned storage spaces to make space for museum furniture and packed up the gift store and some contents from the museum’s community exhibits.